I enjoyed our visit, although I don’t think I could have afforded to stay much longer! Even a Swedish gentleman sitting with us at the conference gala dinner said that Swedes think Iceland is expensive, and that’s saying something! The ISNIE conference was also quite interesting, although with fewer electricity papers than in the past. The paper from which I learned the most and that I found the most thought-provoking was “Copyleft Licensing and Software Development” by Alessandra Rossi and Massimo D’Antoni from the University of Siena. They analyze important differences in incentive structure and in reasons to choose the GPL license or the BSD license; the paper draft has more details on the model, the hypotheses, and their insights. Very interesting. After the cut is a picture and some discussion of the souvenirs I bought from my trip; knitting-related, of course! What else would a knitter get as a souvenir of a trip to Iceland? 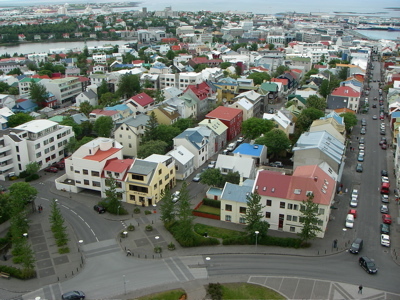 We arrived Thursday morning, checked in to the hotel, and proceeded to walk around Reykjavik. Most shops and cafés don’t open until 10, so we were kind of strolling slowly until we could get a coffee. I knew at some point in the trip that I would have to get yarn, and I knew where to go, but imagine my surprise when we strolled right up to the Handknitting Association of Iceland and its main store. And it was open! 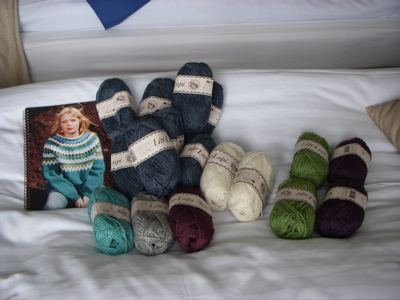 The yarn was gorgeous, and unlike everything else in Iceland, it was a bargain relative to its price in the U.S. I think that for the yarn and the pattern book in the picture I paid $65 tax free. I can’t wait to get started on the sweater! The blue is obviously the main color; the cream will be the cream in the picture, and the aqua, gray, and burgundy are the contrast colors in the yoke. The green and purple yarn off to the right is going to mix in with the leftovers from the sweater to make mittens, hats, whatever I have enough yarn to do. 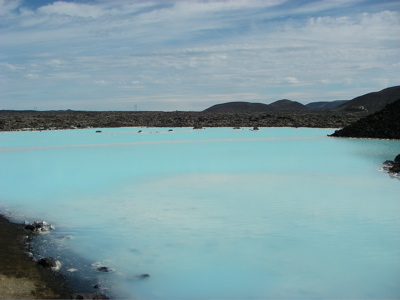 I’m so excited to have an actual Icelandic project, actually from Iceland! Of course you got yarn as a souvenir — what else for you? ?